He was sitting, waiting. She couldn't see him when she came into the restaurant. His table was behind a column. From the corner of his eye, he could see people at tables nearby looking at him, the dozen roses and the empty chair. His heart was pounding. They were about to meet for the first time outside Iran. He had asked her friend to set up the dinner. And instead of her friend, he was going to surprise her. She and her friend were not great buddies so she had a hunch that the date was in fact his idea. But she wasn't absolutely sure. Her face lit up with a huge smile when she got to his table. They hugged for the longest time. And kissed. She looked as beautiful as ever with her oval face and long, dark flowing hair. But there was something different about her. More mature? It had been just six months since she had left Iran after getting her bachelors. She had wanted to experience life away from family and friends, and see the world. He was neither family nor friend. He had been a lover for several years. A long-distance lover. Their relationship was mostly limited to letters and phone calls. He felt immeasurable joy when he would see a letter from her in his mailbox. She always drew a bird on the left side of the envelope to indicate air mail. 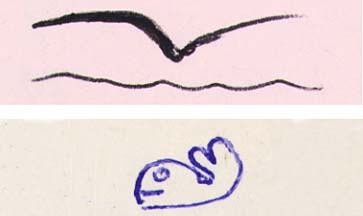 Lately, he had been drawing a little whale on his letters. They had only seen each other during his annual short visits to Iran. Even then, they couldn't be together very often. He had a child who needed his attention. Plus, she lived in Tehran and couldn't entirely ignore the rules set by her family and society about spending time with a man who wasn't her husband. Of course, he would've married her in a second. Her response to numerous pleas was one "Yes", a few "No"s and many "Let's wait and see"s.
But now what mattered most was that they were at last alone together -- in a far-away land. The day after their dinner, she came over to his room at the pension. She sat on the bed and opened her gifts. He had bought her a blue kettle and a china set -- white plates and coffee cups with a blue border. He knew she needed them because in one of her letters she had complained about her plastic plates. They were anxious (he more than her) and nervous (she more than him) knowing that they would be spending the night together. They stepped out to grab something to eat. Took a bus for a few blocs to a store and bought some salami, cheese and bread. And they had an ice cream cone on the way back to his room. It wasn't long after eating their sandwiches that they were in each other's arms. Being in love made all the difference. Afterwards, she curled up against him with her hands on his chest. He lifted her head. She stared into his eyes, expressionless. "It's me," he said with a smile and kissed her forehead. A tear rolled from her eye. She smiled back and held him tight. They were awake for most of the night, sometimes looking out the window searching for the moon. But he also spoke to her in his sleep. "Mr. Producer wants to make a film about us. Get dressed." "What are you talking about? Are you awake?" "Mr. Producer is very upset. We can't be late. Have you had your orange juice?" He woke up from the sound of her laughter: "Mr Producer just called and said the film has been cancelled. Go back to sleep you kook!" In the morning he checked out of the pension. He was going to spend the rest of his stay at the apartment she had recently rented. Getting there was a long journey to the other side of the city. But they sat and talked about the people getting in and out of the subway and the bus. Most curious were the evangelists who had recently invaded the country. Or they just looked at each other every once in a while without saying a word. They were really together, alone, finally, amazingly. When the bus stopped at her station, he was shocked. He saw a housing complex made up of a series of gray multi-level buildings. One look at the dreary concrete blocks and he immediately held her hand in sympathy. He knew how much she loved her family home and her room in Tehran and how much she must have been missing it. Her third-floor apartment was even more depressing. A narrow hallway led to two rooms and a small kitchen. The larger room looked like it had been violently attacked. She had tried to peel off the nauseating mustard-colored wallpaper only to discover more layers of wallpaper. There was no furniture. Only a small black and white TV on the floor. Pieces of paper -- bits of her work -- were spread on the blackened red carpet. It's terribly sad but true. Can't go on like this. She cried on his shoulder like he had never seen her cry; from the gut. She was almost limp. These few months had been hard on her. She was glad he was there. To give her comfort. But she knew and he knew that she would recover. She was brave, adventurous, determined and persistent. And she had a child's unclouded instinct in recognizing basic good, evil and beauty. No matter how ugly her apartment, it gave her independence. She worked part-time and was constantly meeting new people in her own field. She was making small but daily progress. She had a row of small flower pots on the edge of the kitchen window -- "My babies," she called them. She often talked to them with tenderness as she watered or groomed them. One side of the kitchen wall was covered with flyers of various artistic events. They had plenty of time to kill. And they lived it up. They visited the main museum. Having seen dozens after dozens of religious paintings, they debated the existence of God and the big deal about Jesus and Mary. He, as always, only offered half-jokes. She didn't know which half to believe. The fun, easy-going side or the serious, fatalistic one. They went to a 15th century church, and a piano concert, and spent a lot of time in cafes. The bus tour was interesting. They were amused by the guide who spoke in English but not one of her sentences was comprehensible. But probably her favorite spot was a pond with the statue of a young girl in the middle, sitting as if she had resigned to eternal solitude. The inevitable moment arrived. He popped the question again. "What's going to happen to us? " "... I don't know. What do you think we should do?" "Well, I think we should end it right here. That's it. Finished." "Come on... You know what I want." "Do you think that's the right thing do to?" "I do. I always have. I love you. I love you to death. Love is coming out of my ears. I 've never felt so strongly about anyone. And I don't know if I ever will again. To me, living has to come with loving and I love you damn it!" "... I love you too..."
"So what are you afraid of?" He stood up realizing he had been on his knees for a long time -- perhaps too long -- holding her hand and begging for her consent in a crowded square in the middle of the city. The old ladies sitting on benches around didn't understand a word they said but his lover-boy passion play had certainly brought admiration. Well, the curtain had fallen. Before she accompanied him to the airport, he asked her to promise him one thing: "If you ever get married, make sure you do it for love. Nothing, absolutely nothing else matters." In the past,when it was time for him to catch a flight, saying good-bye had been a quick affair -- a hug and a kiss and she would disappear behind the iron gate of her home in Tehran. This time she waited. Looking out the window of the bus that transferred passengers to the plane, he could see her waving and blowing kisses from the roof of the airport terminal. He put his lips on the window glass and sent her kisses back. As the bus pulled away, she got smaller and smaller. The bus stopped by the plane. He got off and waved at her -- now a flickering dot in the far distance -- with both hands, until all the other passengers had boarded. He went up the stairs and into the plane feeling good. He would remember what they had. He could live with that and go on. A week later, he got a package from her. There was no bird on the envelope. And there was no letter inside. Only a Zippo lighter with an engraving: a bird flying in the sky and a whale swimming in the ocean.